Andrew Carnegie (November 25, 1835 – August 11, 1919) was a Scottish-American industrialist who led the enormous expansion of the American steel industry in the late 19th century. He also was one of the highest profile philanthropist of his era who had given away almost 90 percent of his large fortune to charities and foundations by the time of his death. Carnegie also was a pacifist at heart, and starting in 1903 devoted significant time and money to promoting peaceful resolution of international disputes, especially by arbitration pursuant to treaties. He helped to create the Palace of Peace at the Hague in the Netherlands with his 1903 formation of a Dutch foundation and his funding of the Palace’s construction that was completed in 1913. It initially was the site for the Permanent Court of Arbitration, which was established in 1899 and which now is an intergovernmental organization with 115 member states that provides dispute-resolution services for various combinations of states, state entities, intergovernmental organizations, and private parties. From 1922 to 1946 it also was the site for the Permanent Court of International Justice of the League of Nations and since 1946 the International Court of Justice, the principal judicial organ of the United Nations. Carnegie also funded the construction of the headquarters building for the Pan-American Union (later the main building for the Organization of American States) in Washington, D.C. and the building for the Central American Court of Justice in Costa Rica. Another activity Carnegie organized to promote peace was the April 1907 National Arbitration and Peace Congress at Carnegie Hall in New York City. 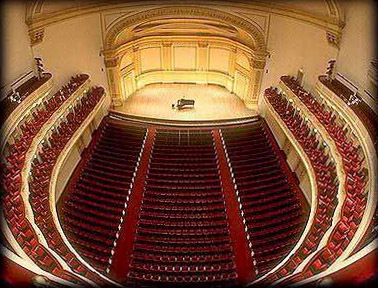 The Hall, as its name suggests, was another Carnegie-financed project that opened in 1891 in Midtown Manhattan. Preceding the Congress, Carnegie hosted a large dinner at his beautiful mansion at Fifth Avenue and 91st Street in New York City to celebrate industrial peace in the U.S. and the upcoming Congress. In attendance were 100 “sons of toil” or workers’ representatives; prominent merchants; manufacturers’ executives; bankers; leaders of universities and other educational institutions; church leaders; publishers and editors; lawyers; and railroad executives, including William C. Brown, then Senior Vice President of the New York Central Railroad (and my maternal great-great uncle). This post is based in substantial part on Chapter XXIII (“The Quest for Peace, 1901-1910”) in Joseph F. Wall’s Andrew Carnegie (Oxford Univ. Press 1970), which won the 1971 Bancroft Prize for best book about history of the Americas (or diplomacy). Professor Wall was a revered History Professor at my alma mater, Grinnell College, and I was fortunate to have known him and learned from him. One of Carnegie’s philanthropic endeavors was funding the establishment of public libraries throughout the U.S. and other countries. My mother was the Librarian at the Carnegie Library in Perry, Iowa, and I studied at Grinnell College’s Carnegie Library during my first two student years. I have had two “contacts” with the Permanent Court of Arbitration. First, a Minnesota company had suggested arbitration of its claim against my client, an Asian manufacturer, under the UNCITRAL Arbitration Rules. Because my client and I did not believe that there was a valid arbitration clause and the claimant had not appointed the first arbitrator, we did not appoint a second arbitrator and then were surprised to receive a letter from the Permanent Court designating an appointing authority to appoint a second arbitrator. There eventually was a three-person arbitration panel that issued an award in favor of my client. Second, I have researched the life and career of Edward Burnham Burling, a fellow Grinnell alumnus (Class of 1890), whose gift funded the College’s library (the Burling Library) that replaced its Carnegie Library. Burling was the co-founder of the eminent Washington, D.C. law firm of Covington & Burling and represented the Kingdom of Norway against the U.S. over expropriation of shipping contracts during World War I with the Permanent Court of Arbitration in 1922 issuing an award in favor of Norway. Writing blog posts about Burling and the Norway case are on my list of future posts. 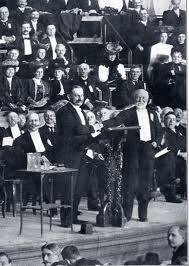 This account of the Congress is based upon Andrew Carnegie’s Plea for Peace, N. Y. Times (April 7, 1907); Stead Recommends a Peace Pilgrimage, N. Y. Times (April 8, 1907); Frenchmen Arrive for Peace Congress, N. Y. Times (April 9, 1907); Prelude to Peace Congress To-Night, N. Y. Times (April 14, 1907); Women’s Part in Peace, N. Y. Times (April 14, 1907); War Talk Opens Peace Congress, N. Y. Times (April 15, 1907); The Afternoon Session, N. Y. times (April 16, 1907); Editorial, Peace on Earth, N. Y. Times (April 16, 1907); Peace Conference Not All Harmony, N. Y. Times (April 17, 1907); Honor Carnegie Friend of Peace, N. Y. Times (April 17, 1907); Editorial, Peace Congress Resolutions, N. Y. Times (April 18, 1907); Editorial, Peace Congress Sequels, N. Y. Times (April 21, 1907); Europe Is Amused at Peace Congress, N. Y. Times (April 21, 1907); Proceedings of the National Arbitration and Peace Congress, New York, April 14th to 17th, 1907 (1907). Roosevelt became a hero for Carnegie, but Roosevelt never liked Carnegie. Unique Party Carnegie Host, N. Y. Times (April 6, 1907). About one week before this special dinner, Carnegie, after a luncheon meeting with President Roosevelt at the White House, made a statement supporting the President’s policies regarding the railroads. 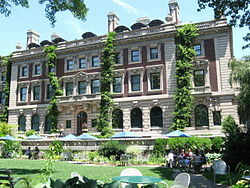 The Carnegie Mansion now is the home for the Cooper Hewitt, Smithsonian Design Museum. Cotter, Newly Playful, by Design, N.Y. Times (Dec. 12, 2014), http://www.nytimes.com/2014/12/12/arts/design/cooper-hewitt-smithsonian-design-museum-reopens.html?hp&action=click&pgtype=Homepage&module=second-column-region&region=top-news&WT.nav=top-news&_r=0#; Cooper Hewitt Museum, http://www.cooperhewitt.org/.